Salted caramels are one of the most addictive snacks out there. Adding salt to sweet, buttery caramels creates just the right balance between sweet and salty and makes your mouth water (in a good way!) while eating them. I often buy these treats when I see them at stores, but it is not too difficult to make sea salt-topped caramels at home – and having a good from-scratch recipe means that you can have them any time you want! These Homemade Sea Salt Caramels are buttery caramels that are topped with a generous sprinkling of coarse sea salt. These are soft and chewy, with a nice balance of sweetness and salt. You will want a candy thermometer to ensure that you get good results, but this is a relatively easy homemade candy recipe that is definitely worth trying. There is a small amount of salt in the caramels to flavor them, but I saved the sea salt in these caramels for the topping. 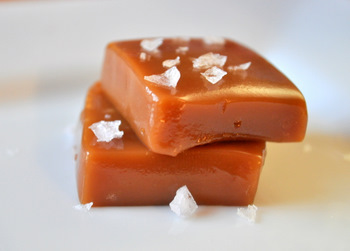 Although some sea salt caramels will use sea salt in the caramel itself, I found that I didn’t notice a real flavor difference when I used the sea salt in the recipe. There is, however, a huge difference between putting table salt and coarse or flaky sea salt on top of these and it is worth getting the good stuff! Any coarse sea salt that you like will work well. I personally recommend flaky Maldon Sea Salt, which has a great flavor, excellent texture and a beautiful look. Once the caramel is prepared, you can pour it into a 9×9 glass or pyrex baking dish. The 9×9 makes caramels of a nice thickness, but if you want to make your caramels smaller (or just make a lot more of them), you can also use a 9×13 pan and get thinner caramels. Do not forget to grease the pan with butter (or vegetable oil, though I recommend butter here) before adding the caramel! The first caramel may get slightly squished when you pry it out of the pan, but the caramels generally come out easily if you remove them immediately after slicing. Use a very sharp, warm (run under hot water and dried) knife for best results. Lightly grease a 9×9 -inch glass or pyrex baking dish with butter or a thin coat of vegetable oil. In a large saucepan, combine water, corn syrup and sugar. Bring to a boil over high heat, then continue to boil until caramel turns a deep honey color (10-14 minutes). While sugar cooks, combine cream and butter in a microwave-safe bowl and cook for 1-2 minutes on high heat, until butter is melted. Set aside. When sugar is a deep honey color, pour in cream mixture. Caramel will bubble up vigorously. Stir until bubbles subside slightly, then stir in salt. Attach a candy thermometer to the side of the pan and continue to cook, stirring regularly with a silicone spatula, until caramel reaches 260F (5-10 minutes). Pour caramel into prepared dish. Allow caramel to cool completely, then sprinkle evenly with sea salt. 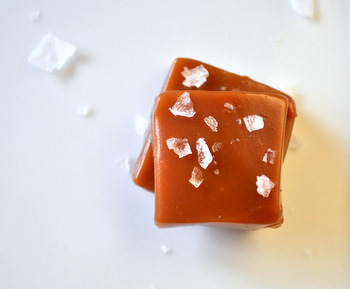 Cut caramels into small squares or rectangles with a warm, sharp knife. Caramels can be served immediately or wrapped in small squares of wax paper. Caramels will keep for a few weeks at room temperature. Makes about 3-4 dozen, depending on the size of your caramels. Do you think that brown rice syrup or golden syrup could be used in place of the corn syrup? You can reduce the amount of corn syrup in the recipe and you -probably- won’t encounter recrystallization problems problems. I’ve seen recipes with as little as three tablespoons of corn syrup per cup table sugar. I would advise against using a different syrup. Corn syrup is mostly glucose syrup, which interferes with sucrose’s ability to recrystallize because it has different stereochemistry. I don’t know Brown Rice Syrup, which is mostly Maltose and Maltotriose, will have the same effect, but Golden Syrup, which is glucose and fructose, will probably work similarly. I suspect it would be less effective and would impart a distinctive taste to the caramels. That said, grocery store corn syrup is no worse for you than table sugar. It is high fructose corn syrup that MIGHT be bad for you. If it is for health reasons, and not availability that puts you off using corn syrup, please consider carefully why you are avoiding using corn syrup if whether or not you are simply joining in on media hype. Also, I find that parchment paper works fine for keeping caramel from sticking to whatever I put it in. Funny, I had a similar question. I’d like to know a possible substitute for corn syrup in this recipe. I have made a similar recipe for a while now and have never used corn syrup. I always use brown rice syrup or golden syrup and they turn out great every time. When boiling the caramel for 10 minutes, should we stir it? Looks yummy and I would love to make these for new years. Iâ€™d like to know a possible substitute for corn syrup in this recipe and I want to make these for new years. First of all I LOVE your site and I think your recipes are AMAZING however I just tried making these caramels and I watched the candy thermometer carefully and I poured it into my pan at exactly 260 degrees and they seem to be much harder than other caramels I’ve had and when looking through other recipes it seemed that they only called for cooking the caramel to 250 degrees. Was this a typo or is 260 the correct temperature? Like the other Lisa above my caramel got much darker than yours pictured and was hard. This was my first time using the good quality (Oneida) candy thermometer I purchased while in the US. I would be surprised if it was the thermometer’s fault, but who knows. Thank you for the great recipe. Made them last night. It was easy and they turned out great. I will have to try this recipe out for a Christmas holiday treat! I just used your recipe after I had a failure with another recipe a few days ago. This time it worked! They taste wonderful! I did add 1/8 tsp of vanilla to the cream. I admit I did not watch the temperature on the first phase (the sugar) and instead took it off the heat after it turned honey-colored to add the cream and butter, then put it back on the heat and stirred constantly. The temperature had dropped down to ~220F at that point and I only let the temperature go up to ~245F (it took a few minutes) before pouring it in a pan lined with buttered parchment paper. I poured it over some chopped pecans. It set up pretty quickly and I added the salt after about 20 minutes. Then at 1 hour I cut it into pieces and wrapped them in wax paper. It tasted wonderful and it was so nice for them to work out this time! Thanks for your recipe!